Bill Kastel and his wife, Tracey, were hoping to catch some extra Sunday morning shuteye when they were awakened early on May 25 by a loud clanking. Opening the front door of the mobile home they’d mounted on five-foot-high stilts near a creek in Venus, Texas, eight years ago, they were astonished to see a river raging below their front porch. Trapped on all sides by water with their cat and five dogs, the Kastels dialed 911 and waited for help. They didn’t expect that help to come in the form of a drone nicknamed “Valkyrie,” operated by software engineer and Joshua Fire Department volunteer Garrett Bryl. Bryl, 43, a drone hobbyist for three years, offered his services to the rural fire department six months ago when he realized that his quadcopter could make a lifesaving difference when people needed to be found quickly. Using his drone, Bryl delivered life vests and a safety line to the Kastels, which Bill attached to a beam on his house. The other end was then hooked to the bumper of a fire truck and a rescue by raft was attempted. “They got close, but in the end, it was too dangerous – they were worried about knocking over the stilts on our house and sending the entire place down river,” Kastel tells PEOPLE. An hour or so later, the Kastels were evacuated by a National Guard helicopter, returning once the water had receded to fetch their dogs and cat. That same morning, Bryl also used Valkyrie to help locate two people trapped in a pickup truck that was swept away by floodwaters near Joshua. So NASA’s solution is what it calls Extreme Access Flyers. These craft, wich seem to resmeble quad-copter drones, would be able to “travel into the shaded regions of a crater and pull out small amounts of soil to see whether it holds the water-ice promised by readings from orbiting spacecraft.” Unlike Earth-bound drones, though, they use gas jets instead of rotors—because the alien atmospheres like those of Mars and the Moon would be too thin to support spinning blades. In addition to scouting craters for water and other elements that can be processed into fuel for large spacecraft and air for humans, the flyer would be capable of exploring lava tubes that are known to exist on Mars and the moon and are found in many volcanic areas on Earth. Because some are thought to be 30 feet or bigger in diameter, an extreme access flyer could navigate autonomously during a robotic precursor mission and find a safe place for astronauts during their journey to Mars. While the project started two years ago, the team has been using rapid advances in commercially available drones to keep the work moving at speed. 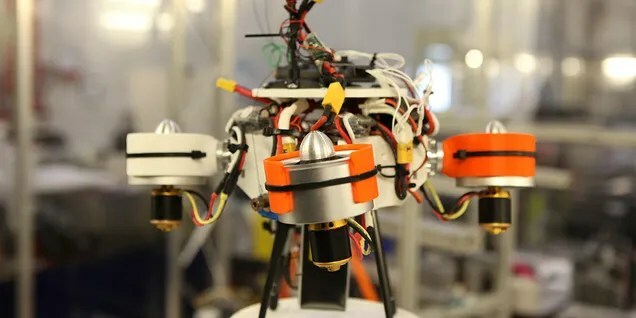 “The flight control systems of small, unmanned multi-rotor aerial vehicles are not too dissimilar to a spacecraft controller,” explains Mike DuPuis, one of the researchers. “That was the starting point for developing a controller.” In fact they’ve already developed several small craft, from a flyer the size of a person’s palm to a large quad-copter about five feet across that uses ducted gas fans to fly. The latter, NASA claims, is the kind of size of drone that would likely be used on a mission to Mars or the Moon. It’s not yet clear when such a mission might happen, though.